Archaeological sites in Suriname date to several thousand years and share many of the prehistoric traditions with much of the New World. Aad Versteeg and Boomert among others, who have done a fairly extensive study of the prehistoric period of Suriname have established, through archaeological evidence, that using a most undeveloped procurement tools and strategies, prehistoric in Suriname changed from simple hunter and fisher folk into shifting cultivators, leaving traces of the impact of their activities on the environment in many place, particularly along the coastal areas. These farmers existed at the time of the visit of Columbus to the new World and the eventual arrival of colonialist in Suriname. Stone tools (axes, projectile points, pottery, rock with petroglyphs and abandoned settlements remain the main sources of information about the lives of these early people. As the land on which these unexplored sites are exploited for timber and mining concessions, disappear, they do so with the cultural material left behind by the early indigenous people and the Maroons. As the plantation system developed in Suriname with the enslavement of both indigenous people and Africans, they escaped in groups farther south, far and near the coastal plantations for their freedom and safety. Among the Saramaka, many more settlements developed in the interior. This further resulted in the formation and transformation of their culture at those settlements. After the Maroons fought the colonial forces for a long time, and no end seemed in sight, peace treaties were signed to end hostilities. Consequently, with the cessation of hostilities, many of those early Maroon settlements were abandoned for new ones along the waterways, while others resettled close to the previous ones. Many of these sites have been historically documented although some were concealed and never known. Hoogbergen published an article and distribution map of known sites some of which have been relocated. Unfortunately some of them, particularly in the Saramakan region, were inundated by the floods of the artificial hydroelectric power dam. Several large-scale multi-purpose hydroelectric schemes have been developed around the world in the last half-century but it is those with significant impact on archaeological sites and monuments that have attracted cultural attention. The project in Suriname is even more significant owing to its impact on one of the only few and remaining natural equatorial forests as well as on the limited land and cultural heritage of a population that has been in search of peace since colonial times. Saving the sites and the associated archaeological material will definitely contribute to the cultural as well as the tourist and economic development for which they would otherwise be destroyed. The culture of Suriname is a rich one and the heritage of the Maroons is part of that culture and it would make sense to save it and the survival of the people who live along the waterways that feed, maintain and protect them and the dam. As you know the hydroelectric power dam continues to threaten many of their settlements including the archaeological sites and sacred burial sites, many of which it has already consumed. The operations are displacing and destroying not only the modern settlements and displacing the people, thus disrupting their already delicate survival, but also destroying the remaining archaeological sites that are the only remaining repository for the ancient cultural remains. Finally, it is widely known that where such developments have been planned, archaeological rescue operations, such as those regarding the Volta dam in Ghana, Africa, have been required to salvage the archaeological sites before any development was carried out. Such a move would be a good one in the right direction and the archaeological resources of the (MHRP) will be made available for that purpose accordingly. 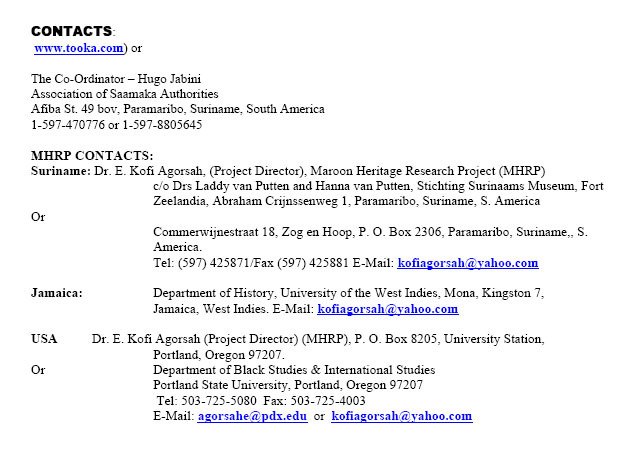 (For more information on the endangered Suriname environment and Maroon land rights see contacts below).